Welcome to the colorful side of life. I went to Coral Gables in Miami this weekend to see a traveling art installation called the “Umbrella Sky Project”. The installation consists of 720 colorful umbrellas, that were hand placed and hung from wires above a shopping plaza. I first heard about the Umbrella Sky Project on Instagram. It’s become a popular spot for Instagram photos and selfies. I couldn’t help but smile as I looked up at the colorful umbrellas. There was something peaceful about looking up at them and seeing them sway back and forth. I glanced down and noticed the shadows that the umbrellas casted on the ground. There were octagon shaped shadows on the ground. I had never been to this part of Coral Gables before. As I walked around the umbrellas protected the plaza from the sun and made the shopping experience more enjoyable. The umbrella sky project was created by Sextafeira, a company from Portugal. The inspiration for this project was to bring color and joy to publix spaces. 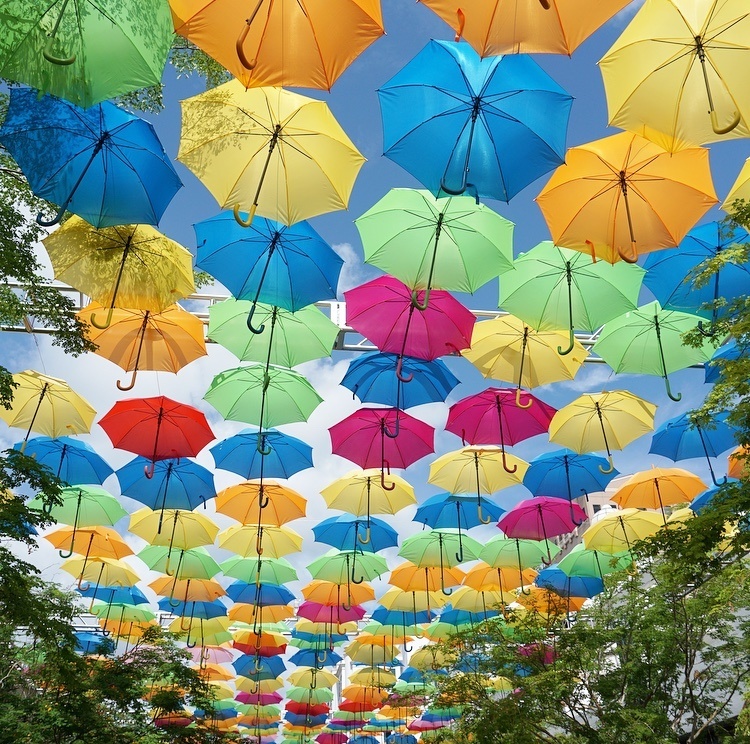 Coral Gables is the third city in the United States to host the Umbrella Sky Project. It’s an internationally recognized public art display that has been set up in Portugal, Lisbon and Paris. If you’re interested in seeing the Umbrella Sky Project. It is displayed on the 100 block of Gerald Ave in Coral Gables. This art installation reminded me of the Museum of Ice Cream. The Museum of Ice Cream is a pop up museum that has staged exhibits that are specifically designed for taking photos. You can read all about it here.